Even as the shame nags at my guts, part of me is dubious. Part of me wants to look her in the eye and tell her that she’s wrong. But she’s powerful, and I’m not, and years of abuse taught me not to stand up to people more powerful than me. So I retain the self-protective shame posture of submission, and I mumble an apology, and promise myself silently that I will never initiate another conversation with Irene again. I was a few months into my breakdown when this conversation happened. It was only one in a series of similar conversations that I’d been having with people for some time. I didn’t understand what was happening to me – my symptoms, my multiplicity, the flashbacks, the dissociation – and the only answer that ever seemed to be offered to me was that I needed to forgive. That my symptoms were evidence, only, of my unforgiveness. My paragraphs become more and more ridiculous. But if this was the answer – if this was the solution to my ever-increasing suffering and torment – then I was quite prepared to write a million ridiculous paragraphs in order to ease it. And of course nothing changed, because forgiveness wasn’t the issue. Trauma was. I nodded, not understanding where she was headed. Aah, yes. Of course. Why hadn’t I seen it like this before? She had a knack of saying profound things simply. ‘So forgiveness doesn’t matter?’ I asked, flipping straight from ‘all’ to ‘nothing’. Good question. What do I think? I realised, after much thought, that I had no idea what I thought. I thought what I was supposed to think: that had been my strategy for surviving life. I tried to figure out what the ‘right’ thing to think was, and then I thought it. When I was trying to get help from Irene, when she unwittingly stepped into the role of attachment figure and activated my primal need for someone ‘stronger and wiser’ than me to rescue me from my pit, I automatically adapted my thinking to whatever she thought, in order not to alienate her: she wasn’t going to help me if I disagreed with her. Naturally I didn’t realise that this was what I was doing: I just assumed she must be ‘right’. But now, in this therapy session, is a new attachment figure who’s playing hard to get. She won’t tell me what the ‘right’ thing to think is. She wants me to figure it out for myself. She wants me to find my own truth. She wants me to think for myself. And it strikes me, at just this moment, that forgiveness is a uniquely controversial issue, where so many people try to impose their views on so many others. You can support your football team of choice, your political party of choice, and even your Strictly or X-factor star of choice – you can disagree with everyone else about your choices – but you must forgive, and if you don’t you’ll deserve everything that’s coming to you. We explored it further in another session. ‘What is forgiveness all about?’ I say, trying to sound nonchalant. Maybe I’ll catch her out and she’ll tell me what she really thinks. ‘What do you think it’s all about?’ Damn. Didn’t work. Now I’m stuck, because I started this train of thought, and I don’t know what to say. Because I really, actually, don’t know what it’s all about. I stammer in silence for a little while. Something is stirring in me now, so I go for it. We have a tacit agreement, right now, that ‘they’ is not everyone; ‘they’, right now, is Irene. I look at the therapist and she’s with me. I’m afraid she’s going to answer my question by asking me what I think, so I fill the gap with more of my rant. There, I’ve said it. I wait for the blowback, but there is none. ‘What would you want to happen instead?’ asks the therapist instead. Unexpectedly, this question brings with it more emotion. Because just for a moment, there I am, the lost child, walking back to the farmhouse after being raped, full of the longing for comfort and care and understanding and acknowledgement. But instead I get in trouble for having mud on the knees of my jeans. I hadn’t made the connection with my rage before. But I see it now, suddenly: the child who wasn’t acknowledged and instead got into trouble for being raped, ends up as the adult who isn’t acknowledged and instead gets into trouble for having been raped. Because she just needs to ‘forgive’. What I wanted to happen is obvious, but it sears through me like a hot skewer. I sit and quiver with the pain and the rage and it’s a comforting silence for a while as the therapist sits with me. She doesn’t need to say anything. I just need to know that she is with me, and that she is for me. I know that she sees. I know that she cares, and that is enough. It’s one of those moments where what I say doesn’t hit me until I’ve said it. And I realise, at that moment, that all my life I have tried to push it away, to disavow, to dis-remember, to deny what happened. I’ve tried everything in my power to not take hold of it. I hadn’t even got to point A, let alone point D.
I trail off as sadness wraps itself around my throat. There are moments in therapy, and this is one of them, when the pain is unbearable. If it were not for the empathic presence of another human being, supporting me, holding this space open for me, giving me hope, I genuinely believe I would die. She doesn’t even have to say anything. This is the fruit of a multitude of sessions: the ‘with-ness’ of another human being, which makes the unbearable bearable. ‘Forgiving them is easy, because it’s not real forgiveness,’ I explain. ‘Because you’re not really blaming them. You’re blaming yourself. Forgiving yourself is so much harder. That’s what’s impossible … nearly. You blame yourself for the abuse, so it’s not really about forgiving them. That’s not the big issue. So all that tells me is that people like Irene don’t get it. They don’t get it at all.’ I feel surly and teenage-like and part of me wants to kick the coffee table by my feet. ‘They’re telling us to forgive because it makes them feel better. They’re controlling us. But if forgiveness is about cancelling a debt …’ – I make this leap out of nowhere and I’m not sure of the logic, but it feels right, for the moment, so I press on with it – ‘then surely you need to know what that debt is first. Surely there needs to be a bill. Surely you need to know who owes what. I look up, away from my rant, to see the therapist nodding slowly, willing me on. She wants me to follow the thought through, because it is my thought. Something is still bothering me. There’s something I haven’t seen yet. I press on to find it. I pause for breath, but not for long. ‘The damage has been caused, and it still has to be fixed. We’re still traumatised. Forgiving them, writing off the bill, doesn’t miraculously fix the damage. It just means that we agree to pay it, because they won’t. So instead we focus on fixing the damage, rather than getting even. Because if we spend our whole time insisting that they pay the bill, we don’t heal. That’s all. Because there is nothing they can actually do, now, to make it better. They can’t undo the damage. I stop, overwhelmed with sadness again. Something like tears is trying to force its way out of me. It’s like being strangled. I’d be happy to cry, but it’s as if the tears can’t find the way to my eyes. They stick in my throat instead. So many feelings, and I don’t know what to do with them. This isn’t an academic discussion, as so many debates around forgiveness are. It is pain and guts and suffering and shame. I feel split open. ‘Just breathe,’ the therapist reminds me, gently. Sometimes I’m irritated when she says this, like she’s being patronising or changing the subject, but for some reason right now I hear the compassion in it, and I realise that my chest is tight with the effort of not breathing. I sigh it out, deliberately. And then the words come again. I feel relieved, like a pressure has been lifted. The someone, again, is Irene, but I can’t name her just now. I sigh, in exasperation, angry again. ‘All I’m saying by forgiving someone is that I’m not going to become an abuser and abuse them back. But I’m not condoning it. I’m not saying it isn’t wrong. I’m not saying it didn’t cause damage. The way Irene talks about it is scary. It’s almost like it’s an invitation to abuse. It’s a free pass, a get-out-of-jail-free card. My anger rises another notch. She smiles, softly. ‘What do you think?’ Inside, I groan. I point out to myself, internally, that I am a bag of contradictions. It seems there is no other way. My thoughts tumble against each other noisily. There’s not enough space to get them all out in one go. It’s an interesting exercise in mentalising. I might be wrong, but in the course of this conversation I’ve gone from feeling victimised by Irene to pondering her viewpoint. It’s progress. ‘I don’t think most people can handle the reality of the abuse of children,’ says the therapist, unexpectedly, and with a startling gravity. She seems deeply moved. It suddenly occurs to me that she is moved by what happened to me. It also occurs to me that she has never once pushed me towards forgiveness. ‘Forgiveness doesn’t mean you have to have a relationship with them,’ she says and she’s trying to be neutral but I know where she’s headed with this one. Silence for a moment while I contemplate what I’m saying. I feel exultant all of a sudden, like I’ve found magic treasure. 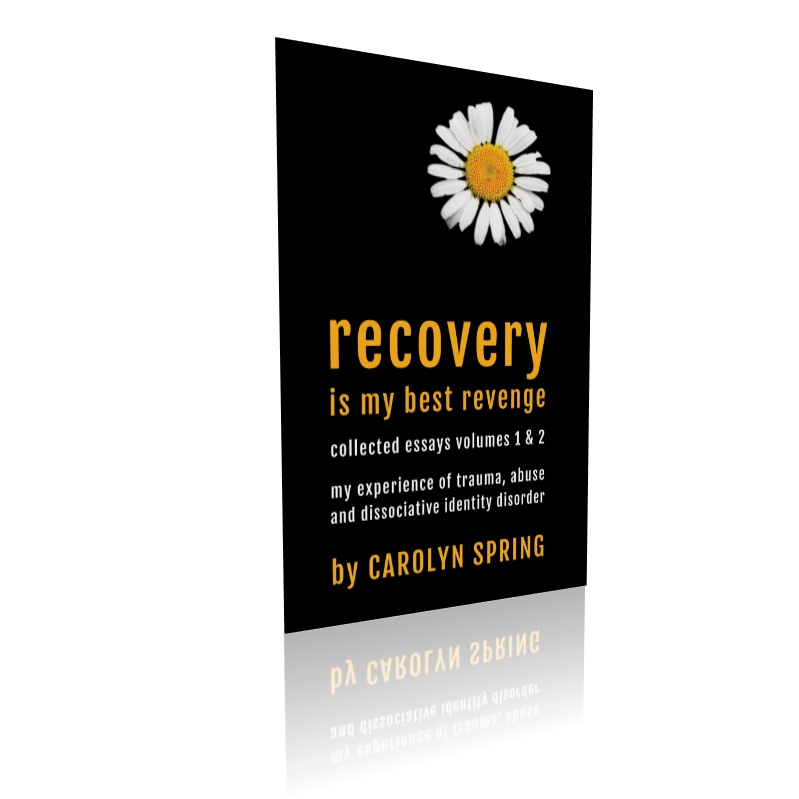 ‘Recovery is my best revenge,’ I say, bringing it all together. ‘And who do you want to be?’ the therapist asks. The question is too big for me, but right at this moment, I have a glimpse, and I latch onto it greedily. The rage has gone. In its place is a quiet hum of determination and energy. I feel energised. And I see the contrast – between Irene and the therapist: one who left me sagging, empty, disillusioned in shame, while the other allowed me to find my own truth. I have a clear vision of forgiveness now, but it is not Irene’s. It is not for her sake, but mine. I will not abuse them back, I swear to myself silently, on the inside. But I’ll still get a revenge, of sorts. I won’t be defeated. I’ll rise again. Recovery is my best revenge. Fantastic work and a great write up of a very hard situation to deal with. You are wonderful and brave. Again, wow. So many times I read your blog Carolyn and where my words have failed me, hidden behind my trauma, you give me scaffolding on which to place my own mess of thoughts feelings and sensations, until I find the words. Thank you. Absolutely and utterly true. I would add a few remarks of my own. Not everyone wants revenge, not everyone wants to hit back. Anger and disgust and bitterness are all emotions to be worked through and not to be denied. I just want the hurt to stop. Thinking of revenge for me means still thinking about the criminal and the things they did to me – I don’t want to do that. After healing and recovery if I want anything at all it is justice and exposure can be enough justice. Some acts and behaviours are simply unforgiveable except by a divine being – and I am certainly not that!! Anger is justice, but not if used against anyone at all. Anger makes us realise what was done to us was wrong, wrong, wrong. For me anger is good because it is energy and I am no longer afraid. Forgiveness is not necessary at all for me to move on. It may be ‘suitable’ for the community/family/church/others if we keep quiet and don’t rock the boat, social control is always so much more comfortable for ‘others’ than the abused. Living our lives to our fullest potential without ever having to think about the criminals again (if only) is what is needed. Forgiveness is not necessary for that. I want all my time and efforts and work for me. Forgiveness just gives to other people all the time. I do not wish them any harm, but I don’t want anything to do with them ever again and I certainly do not want to give them anything else at all, they have already taken too much from me. If they want forgiveness then they perhaps can ask a divine being for it. Because it is not mine to give. Wow, with you all the way. Thank you Carolyn. I really needed to read this today! I’m no where near my point A. Right now I’m struggling with the impossible enormity of all my trauma. I do understand the basic idea of Forgiveness, as having spent my whole life in the church. However I never really got the idea of it being moreso for our own healing process, than letting them off the hook. Thank you so very very much for sharing this. k this was long to read and I did. Thing is some things are unforgivable, this is where you have radical acceptance. It does not mean you forgive what happened, yet you acknowledge that is was NOT ok, and how to help you move forward. Good trauma therapists know that. They would never lead a patient by telling them they have to forgive. Telling an abused person they must forgive is basically fueling a patient to continue to the self-torture of what happened and that they should play nice with their abuser, nope, not right! Aknowledging and releasing my trauma giving it a valid place in my healing and the companionship of someone listening deeply without judgment brilliant article bang on !! Thank you for this article I read it on the train to work. I am currently looking for a trauma therapist to work through my issues. This gives me hope. You have no idea how grateful I am for your thoughts on this topic! Finding myself in a similar situation. I see you!